The Lecco railway station is the main railwaystation for the city and comune of Lecco. In Italian, it is called Stazione di Lecco. 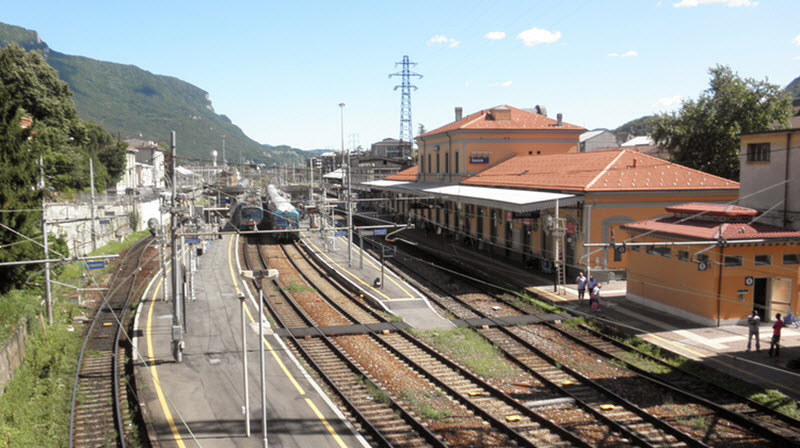 You will find this railway station in Piazza Lega Lombarda, at the northeastern edge of the Lecco town centre. In an average year, this stations has around 7 million passenger movements. More than 150 trains call the station on a daily basis, with the main destinations being Monza, Sondrio, Tirano, and Milan. The Lecco railway station is included in the S8 line of the Milan suburban railway service, a commuter rail system serving the metropolitan area of Milan. 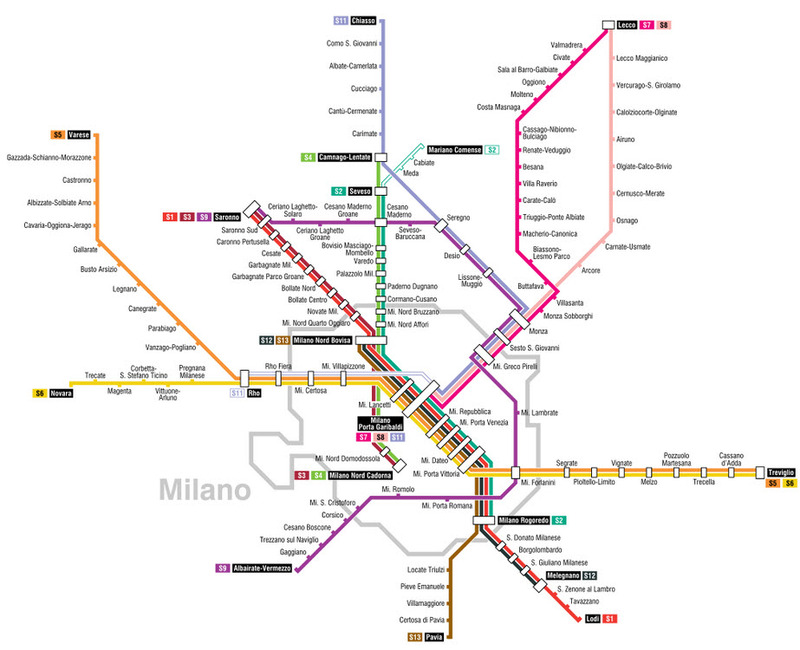 On the map below, you will find the Lecco railway station on the pale pink line to the north. The railwaystation is managed by Rete Ferroviaria Italiana (RFI), except for a commercial area managed by Centostazioni. Both companies are subsidiaries of the state-owned Ferrovie dello Stato (FS). The train services are operated by the regional railway company Trenord. The passenger building consists of three sections. The main section is on two floors, while the other two are only single-storey. The main section is where you will find guest services for travellers, and this is also where the local station master is. There is a central lobby area bordered by side aisles. In addition to the main entrance, there is a secondary entrance from Via Balicco, the road the runs parallell to the tracks. Toilets are found in a small one-storey structure next to the passenger building. The station yards have five through tracks with platforms connected by two pedestrian underpasses. In addition to this, there is a track to the goods yard, and a dock platform intended for trains from the south. The goods yard have goods sheds converted to storage. The tracks have been dimantled. In front of the passenger building, you will find a taxi stand and a bus stop. The buses link the railway station with the rest of the province. The Lecco railway station was opened on 4 November 1863, as the Lecco-Calolziocorte section of the Lecco – Bergamo line was inagurated. Major renovations and alterations of the Lecco railway station were completed in 2009. Among other things, a new central area with side aisles was created in the passenger building and the exterior recieved a new facade. The railway stations was also made more accessible by removing architectural barriers.